The Rosedale Volunteer Fire Department was founded in 1924. 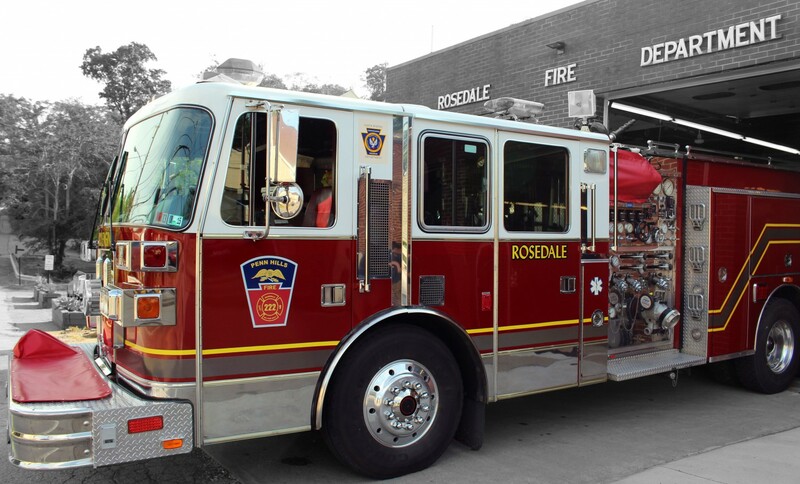 Rosedale was the second volunteer fire department formed in Penn Hills. The thirty original members, led by Chief Matthew M. Alcorn, did not have any equipment and responded out of one of the member’s, W.C. Wilson’s, garage. Later, the members began responding out of Chief Alcorn’s garage until the first firehouse was erected in 1933 on Verona Road. The original method of dispatching calls was by calling the residence of one of the members, who would sound the alarm at William Penn School. On July 29, 1924, the Department responded to its first fire call. The Department’s first apparatus was delivered on August 5, 1924. It was a Model T Ford Chasis with American LaFrance Equipment, however it did not have a pump. The Department bought its first pumper just two years later in 1926. In 1942, the Department began providing the first ambulance service in Penn Hills, which was developed by Chief Alcorn’s sons in his memory. A new, “State of the Art” station was built in 1948, which the volunteers still respond out of today. During a genealogy search of old family pictures I have discovered a photo of my Great Uncle in a Rosedale FD uniform (Circa 1920 – 1930?) Please have your Historian contact me at perrynpat@yahoo.com and I’ll share it with him/her.